Recently there has been much hoopla made concerning the debt ceiling and the recent deal struck between Republicans and Democrats to raise the limit on Uncle Sam's credit card but with corresponding cuts in government spending. I'm not going to get into the political implications or whether it will solve the long term issue. What I want to talk about is what the existence of a 14 trillion dollar debt (yes, that is $14,000,000,000,000) says about our society, about our culture and about Christians living in that culture. I started gardening three years ago. We have three acres of land behind a public park and to help deal with the stress of owning a business, teaching Sunday school and raising two teenagers (and they are good ones, can't imagine what having difficult ones is even like) I began to plant vegetables and discovered I have a 'green' thumb. I'm still in the learning stages and I am getting more and more produce every year. I enjoy it, it's inexpensive and it helps me keep my sanity. The soil where we live is very dark and very rich. But it is filled with rocks. I use raised beds to make sure the roots can grow deep into the ground (I've pulled tomato plant roots out of the ground that were six to eight feet long). 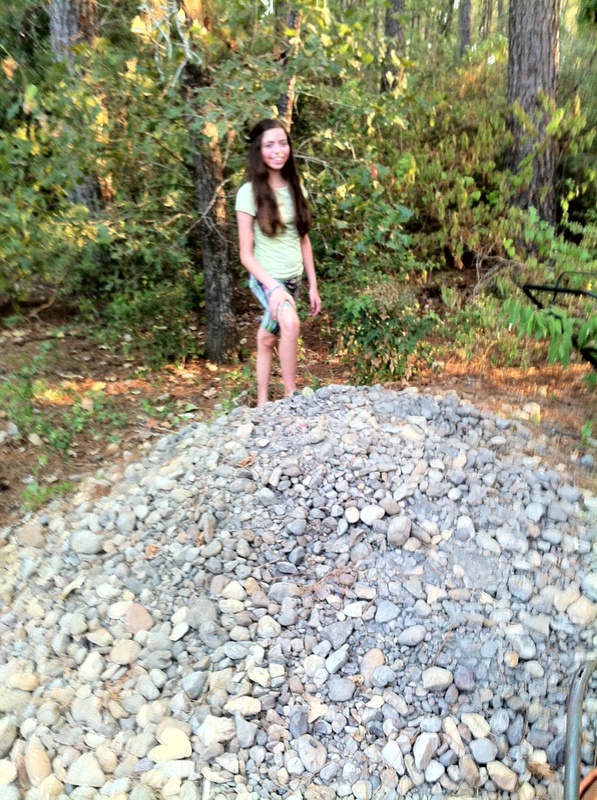 So I proceeded to manually clear rocks out of the ground. As you can see by my growing pile (3 feet high in the center and about 10 feet in diameter) I am not exaggerating. The area I have marked off for the garden is approximately 30' x 20' and I have only cleared two thirds of the sectioned ground. Count a 'french dam' I made in the middle that is eighteen inches deep, foot wide and twenty feet long and filled with aforementioned rocks and you are beginning to get the idea of what I am talking about. All by hand and a garden hoe*. Now I know some of you think right now that I am just plain nuts. Why not get a tiller and be done with it? Well, because a tiller wont really solve the problem. 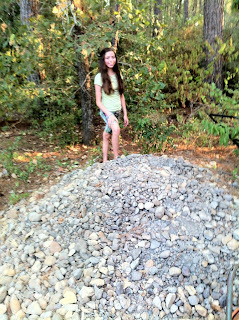 It will move the rocks around but its not going to get rid of them. But we are getting ahead of ourselves. What we need to know is why the rocks are there in the first place. Now some of you will argue that it really doesn't make a difference why the rocks are there. They need to be moved. But what if I had told you that I had hired a bulldozer to mix several tons of rocks into the ground thoroughly with the soil and that was the land that I chose to grow my garden. Then I would indeed be insane. That is exactly what we did with the national debt. We kept electing politicians who promised us free medical care when we got older, a paycheck till we die, cheap pharmaceutical drugs for life, food stamps for everyone who even thinks they need them, free lunches for our kids at schools (and we can fight two wars at the same time! ), etc, and then wonder why we have a 14 trillion dollar debt. We allowed our government to run this debt up so that we would not have to help those less fortunate than ourselves and allow government agencies to take care of people we should have been taking care of so we could live our lascivious lifestyles without paying higher taxes. Now we balk at paying back money we spent and did not have. We made our bed but we have absolutely no intention of laying in it. Christians are suppose to be the salt and light of this society. We are not to live as the world lives but Godly, Holy (separated unto God) lives. Where were we while all this was happening? We were lining up at the trough with our 'Prosperity' message that God wanted to make us all rich and have half a million dollar homes with a luxury sports car in the driveway. Jesus wasn't about sacrifice, he was Santa Clause with an unlimited platinum credit card to make all of our material wishes come true. What is absolutely despicable is that even as we all made large amounts of monies in the decades of the 1980's and 1990's we spent it frivolously. My guess is right now in the Church probably ninety seven percent of the congregation cannot write you a $1000 check even if their very life depended upon it. I am in that category. Brothers and sisters in Christ, this has got to stop. We have to show our society how to change its spending habits and to be lenders and not borrowers. We have to be faithful stewards of God's money. Stewardship is the management of resources that are not your own. In the 1970's many Christians led the way with the environmental movements that showed us we were not being good stewards of God's planet (I am not an advocate of Global Warming. Having said that, I strongly believe in the frugal use of resources and I am against industrial pollution). The Church needs a financial revolution. It needs to begin with ourselves. Two years ago I started digging rocks in our finances. Rock by rock I am paying down our debt. Rock by rock cutting out expenses. Rock by rock cutting out excessive eating out. It has required major changes in the spending habits of our family. I would like to tell you that my family all jumped aboard wholeheartedly and was in total agreement. My life unfortunately is not a sitcom where everything gets resolved in 30 minutes. It has not been easy, but we are getting there and the family is beginning to see the light. Well, a little bit anyway. Within the next two or three years, Lord will it, we should be completely, 100% debt free. The national debt debate is far from over. Part of the deal that the Republicans have made with the Democrats is that a bipartisan panel must come up with more cuts between now and the end of the year. It is almost certain we will hear much, much more about this in the coming months. What we do with this debt will tell future generations all they will need to know about our character. Did we bring out the tiller and move things around and put more fertilizer over it and hoped it would go away? Or did we start taking out the rocks, one by one and with the clear understanding that it may not have helped us but saved the ones to come? I am going out to dig some more rocks. *(Digression: thanks for corrupting the word 'hoe'! Just like the word 'gentleman' which originally meant a landowner not a nice person and so now I cannot use the word 'hoe' without my teenagers giggling). It's not about being Christian. This is ridiculous. Why don't you appeal to everyone, and not just your silly cult. We are all in this together to fix the debt and the consumptive spending habits.